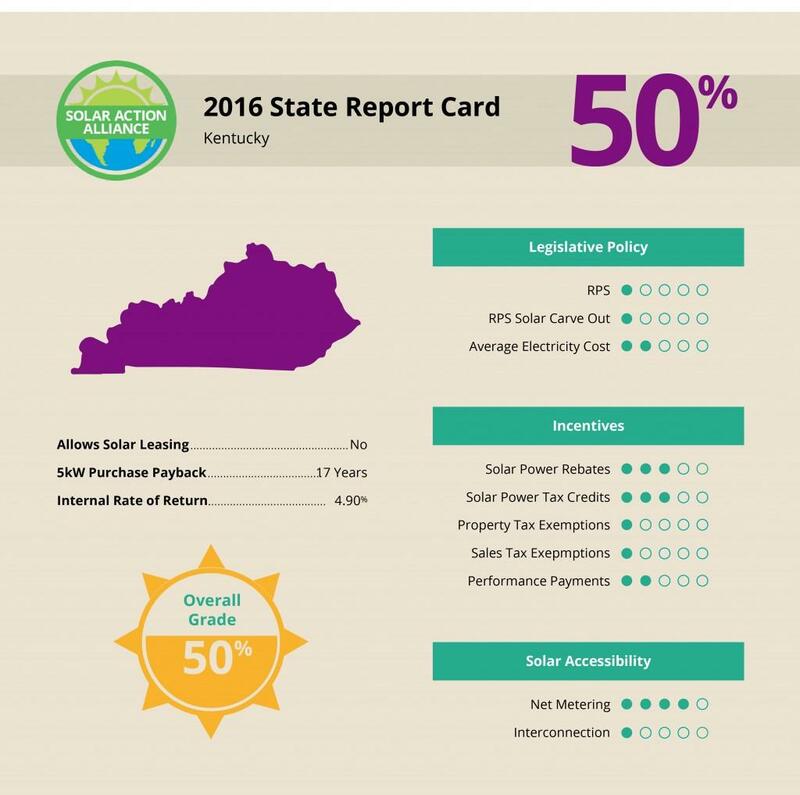 Kentucky Solar Energy: The Grass is Always Bluer – How’s Solar Energy? The Bluegrass State sits right at the midpoint between the north and south geographically, so naturally it has moderate temps that don’t get to high in the summer or too cold in the winter. The presence of consistent solar panel energy varies from place to place, but there is potential for a good solar upstart in the coming years. Also, Kentucky benefits from its location in the Tennessee Valley, which means solar installations are entitled to rebates provided by the Tennessee Valley Authority (TVA). More than half (56%) of their days are sunny on average, and 26% of days on average have no clouds to block the sun. This leads to the public perception has been that Kentucky is “too cloudy for solar panels,” but this is outdated information. 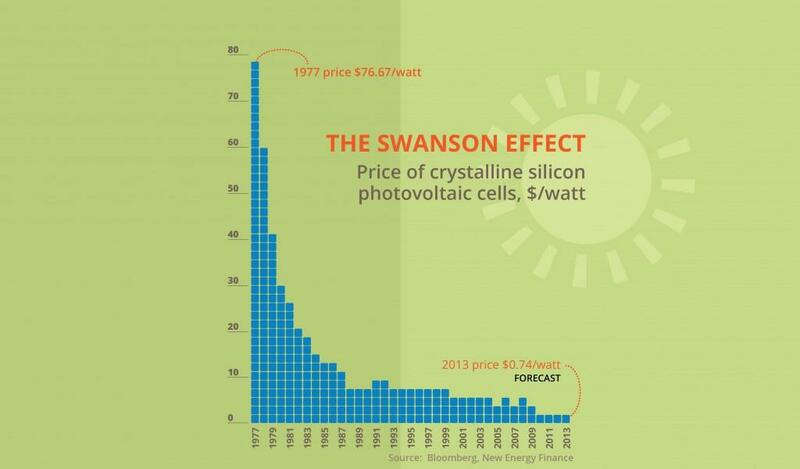 Photovoltaic (PV, or solar) panels are capable of converting solar energy with increasing efficiency. The ever-decreasing cost of PV panels makes this even more feasible, especially with a continued push from the federal government lowering upfront costs. 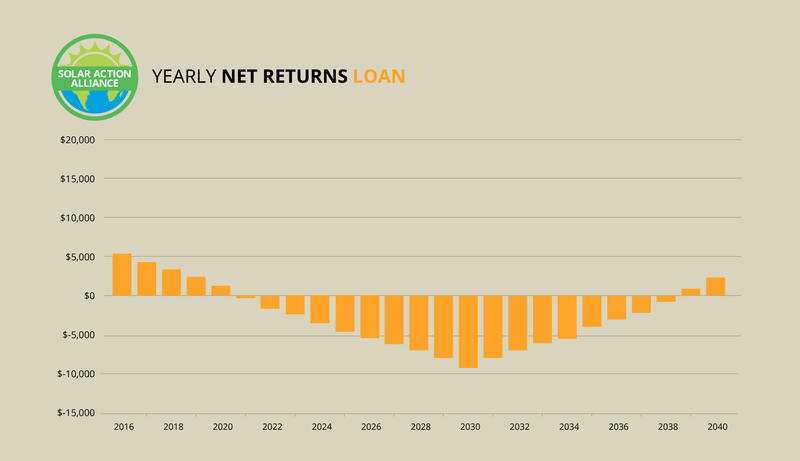 The above graph illustrates the expected returns for the 25-year life of a solar panel installation, considering the costs and returns of buying with a home equity line of credit (HELOC) versus buy large or small installations. As usual, the buying option incurs the most upfront risk with the largest returns later in the installation’s life cycle. A smaller installation carries have the risk and half the reward, but the lower upfront costs may be a more realistic goal out of the three. 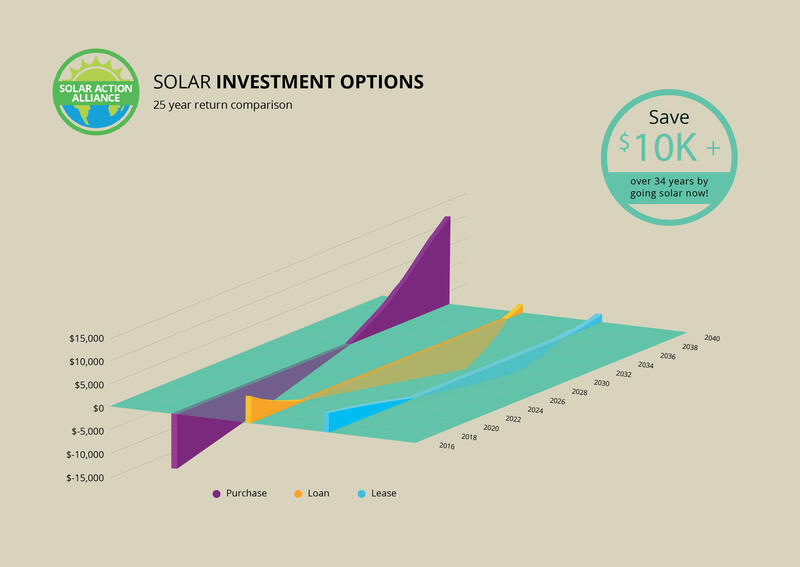 The buying option carries with it the benefit of ownership of the solar system from day one with no money to repay. This is a good option for those who have the cash to pay for it upfront and the patience to wait for a return on the investment. The added incentives provided by TVA rebates and federal credits bring the first year cost down to reasonable levels. For instance, a $20,000 installation would first receive a $1,000 rebate from TVA and a 30% Federal credit on the remaining $19,000 would be about $6,300. Factoring in the savings on electricity plus the additional $0.02 per kilowatt hour paid back by the TVA, and you can add an additional $700 dollars to the first year savings, which at this point approach $7,000. This means you’d pay around $13,000 for the system, which is much more reasonable price. 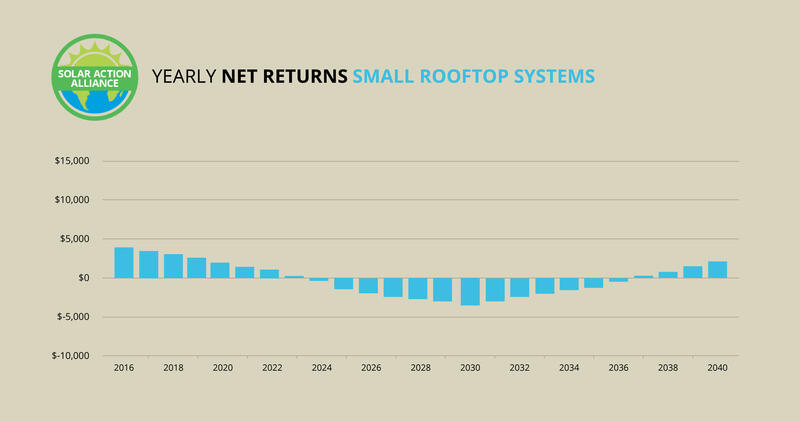 After the system has paid for itself via savings over the course of 16-18 years, the savings can exceed $1,100 per year, which adds up to as much as $10,000 or more over the remaining time of the system’s life cycle. Assuming the normal system detailed above is about 5 kilowatts, a small system of 2 kilowatts would carry the same benefits and downsides as the larger system divided by its size. Smaller installations mean you’re also subject to the rise and fall of electricity prices, and Kentucky’s inconsistent sunlight means that there will be more ups and downs with in the savings. Fortunately, TVA offers the same $1,000 rebate for smaller systems instead of the percentage based incentives employed by tax credits, meaning this rebate takes a much larger portion off of smaller installs, and the 30% federal tax credit still applies. A standard loan payment would exceed the amount of savings for the first 15 years, or however long it takes to pay off the loan. After the loan is paid, the savings will net a few hundred dollars per year, which means a few thousand dollars over the course of the remaining ten. This is the most feasible option for low risk, low reward customers. Kentucky’s low electricity prices makes this option less lucrative than it is in other states, but it’s still a reasonable long-term investment for those looking to go green. Because the TVA offers the same $1,000 rebate for small systems as they do for large ones, the smaller system plus a HELOC loan is a better choice, though the 30% federal tax credit would be a much larger number for a large installation. The tax credits, which would equate to the same $5,500-$6,000 for buying, would offset the loan payments for the first couple years, after which a spike in continued costs will occur for the next 13-15. Once the loan is payed off, however, the savings will be closer to breaking even when the 25-year life cycle is up. This option is primarily for those who care more about benefitting the environment than making money. 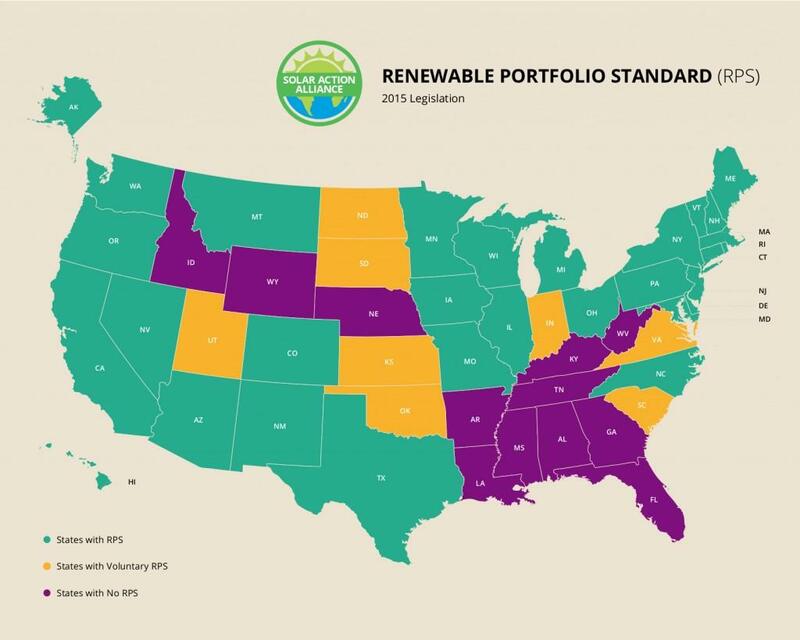 A Renewable Portfolio Standard requires states to increase their renewable energy portfolio according to certain criteria in a certain amount of time. Failure to meet these requirements means penalties that often exceed the cost of compliance. Kentucky doesn’t employ a Renewable Portfolio standard. Kentucky has the Division of Renewably Energy backing its solar panel push, but their net metering and tax credits are the only solutions currently in effect. It can be said that among the available forms of renewable energy, the state does seem to put a great deal of focus in the solar component—as opposed to say, hydroelectric or biomass. They employ the required amount of enthusiasm on paper for a genuine turnaround, but lack of an official RPS diminishes Kentucky’s standing considerably. As mentioned, Kentucky benefits from being a part of the Tennessee Valley Authority (TVA). They have a strong incentive-based program called Green Power Providers (GPP) which not only encourages local utility companies to supplement their electric provision with renewable energies, but offers rebates to those paying for new installations as well as monthly bonuses. Their state tax credits only apply in specific conditions, but the net metering solutions are a positive step, but exemptions for sales and property tax would really bolster the initiative of prospective buyers and vendors.